AmpliTube 2 arrives today with new effects, recording, bounce to audio, export/import, practice tools, and in-app purchase of extra stomp modules. I’ve been playing with a pre-release version for the last few days. Combined with an audio interface like IK Multimedia’s own iRig, AmpliTube 2 turns your iPhone or iPod touch into a handheld, pocket-able workstation. But let’s step back for a moment and consider what that means. What would you want a device to do for your music if that device fit in the palm of your hand? Last week, I raised the question of physical size, inspired by a great quote by Sasha Frere-Jones – there regarding listening, not creation, but just as apt. The message was, in short, size matters. An iPhone is not an amp. But an amp – a big box designed for the purpose of making lots of sound – is not an ideal practice tool. So, one of the clear advantages of something like AmpliTube is the ability to plug in a personal listening device and just practice, complete with effects and amp sounds, without disturbing others. AmpliTube 2 accordingly adds news practice tools, by importing sounds and allowing you to adjust speed of playback, ideal for learning tracks. 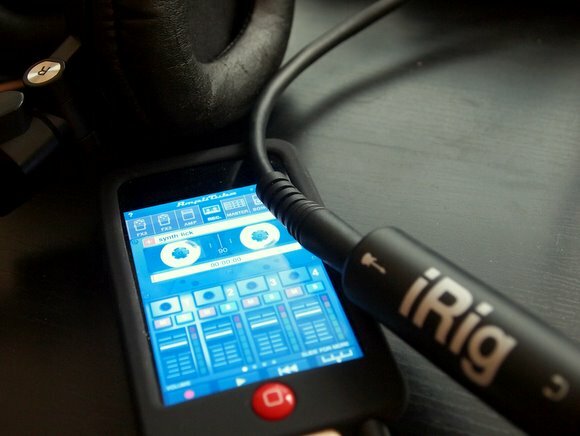 AmpliTube, coupled with a US$40 (street) iRig, lets you record and monitor simultaneously via a single 1/4″ jack input. Other accessories work, as well. 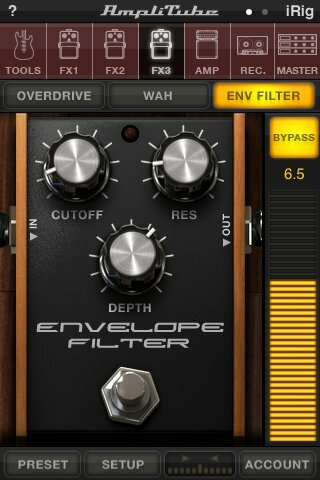 Stick this next to your other gear, and you can always record and add effects to sounds as you create them. 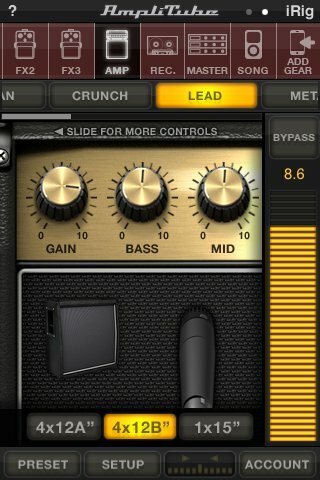 But AmpliTube isn’t just for guitarists wanting a pocket-sized practice amp. With AmpliTube’s beefed-up recording capabilities and effects, it becomes a handheld recording sketchpad, not only for guitarists but anyone wanting to record, well, anything. That has two advantages. It’s mobile, so you can record in a practice studio without opening up a whole laptop. But more subtly, it can be a tool better-suited to sketching ideas and building the raw materials of a track than a full-blown DAW is. Think of it this way: you’re fiddling with a synth, or playing a quick guitar line, or making sounds with a toy you got off of eBay. Sure, you could immediately open your DAW, but then you’re in the mindset of a tool designed to build finished tracks. For play and exploration, staying away from the computer, and using something scaled to your hand that you can carry anywhere, can be a big boon to performance. As we saw with Moog’s Filtatron earlier this month, having a tool that not only records audio but adds some creative effects enroute can be a whole lot of fun. Now, you can add AmpliTube to the same category. 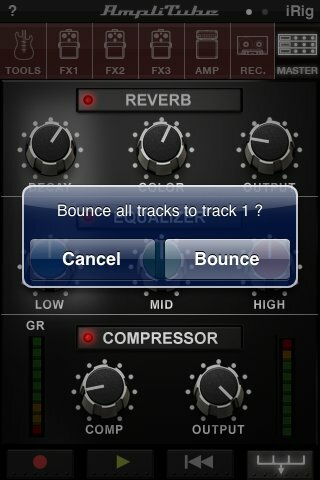 Producers long ago discovered the advantage of the bounce: it commits you to making a sound that you can’t touch. With all that audio apps can do, that can be critical. Many readers have complained that iPhone apps and the like win big on novelty, but don’t fit into their workflow. That means subtle additions – easy bouncing of tracks, easy syncing of files to and from a computer – are absolutely essential. My answer, personally: who cares? If we constantly compare iOS apps to their desktop counterparts, we can easily miss the point of both. To me, it’s more fair to ask, how is recording a song on an iPhone different than doing it on a computer? I hope to have some quick videos of AmpliTube and Filtatron in the next couple of weeks, but I find them terrific tools for capturing ingredients for later productions, and as companions to other mobile devices. Kudos to the blog Palm Sounds. Before the iPhone was even announced, that author appreciated the advantage of making things smaller, for creativity and practicality, appreciated that they’re not a different animal, not simply a replacement for existing tools. AmpliTube is just one of many tools competing in this space, but with some of the potential of handhelds in mind, here’s a tour of what’s new in AmpliTube 2. 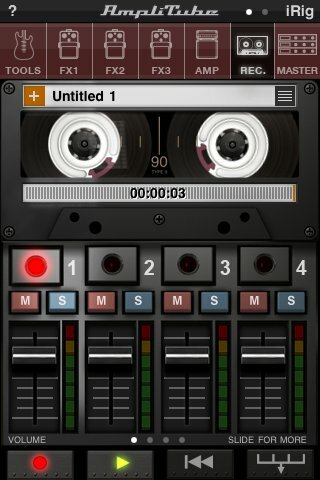 Record: A free, included one-track recorder tracks input, with or without effects, to audio. You can also add effects afterward. A paid-add-on (US$9.99/EUR7.99) will boost the recorder to multi-track functionality, as pictured here, and adds a master effects section with reverb, EQ, and compression. But there’s something nice about the simplicity of the one-track version, too. Bounce audio: Export recordings and mixes as WAV files or (for emailing) MP3s. That should resolve complaints about the fidelity of the output on Apple’s mobiles. File sharing, import/export: You can import songs directly from your iTunes library, or use file sharing or wifi, making it easy to grab a song for practice later – or, for producers, perhaps as a way to sketch new ideas atop existing tracks. …and practice features: Once you’ve imported, as you can see in the controls behind the dialog above, you can practice with the track. “SpeedTrainer” slows or speeds playback without impacting pitch. 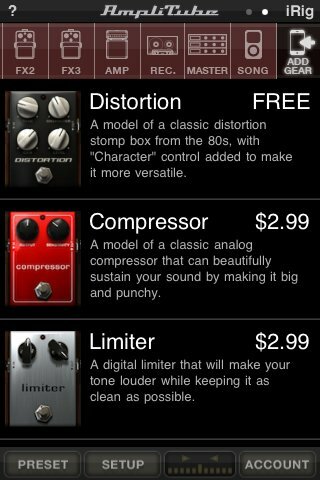 New effects, stomps: Compressor, Reverb, Parametric EQ, Graphic EQ and Limiter are all available as in-app purchases. With all the versions, including the free ones, IK say they’ve improved the sound quality of the gear and ported DSP code from their Mac and Windows software, AmpliTube 3 and T-RackS 3. You certainly get top-grade effects, I’ll say that. Presets/snapshots: You can now name presets. 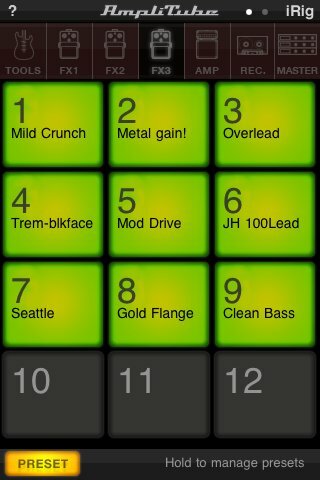 That means calling up favorite combinations is easy, particularly with AmpliTube’s grid-style preset layout, pictured here. In-app add-ons, purchases: Taking advantage of a feature afforded them by Apple, IK now sell additional add-ons. Before that turns you off, the stock versions do include plenty of effects. What’s nice here is, you can pick out what you need. We could be looking at the future of audio software in general, though this does illustrate an ongoing complaint I hear from some users about iOS: they want to be able to mix and match effects from different vendors, just as they can on PCs with technologies like VST and ReWire. So far, that isn’t possible on iOS, though developers are investigating the issue. I have to wonder, at the same time, though, whether some of those restrictions aren’t creatively useful. 3 simultaneous stomp slots, plus an amp with effects, cabinet, and mic settings. AmpliTube: 11 stompboxes, 5 amps + cabinets, 2 microphones $19.99/€15.99. 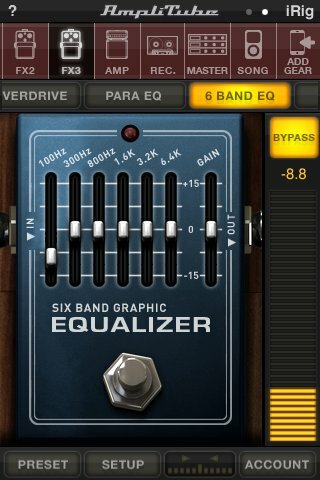 AmpliTube LE: 5 stompboxes, 1 amp + cabinet, 2 microphones $2.99/€2.39. Additional stomps are US$2.99/EUR2.39 each. Stay tuned for some video; let us know your impressions if this is something you use.